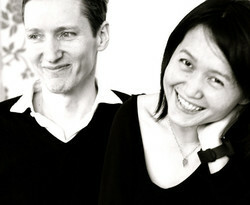 Lemongras Design Munich is an industrial design studio founded by Carmen Cheong and Moritz Engelbrecht in 1998.Carmen was born in Singapore in 1970. After graduating as a product designer, she moved to England where she had been working several years in the furniture design industry. Later on, she enrolled in the Industrial Design Master’s Program at the Royal College of Art in London where she met a fellow student called Moritz. Moritz Engelbrecht was born in Berlin in 1964 and has been planning interiors and furniture since he graduated from the Munich Technical College. His deep interest in furniture led him to further study furniture design in London, where he met the other half of what was to become Lemongras Design. Coming from two different cultures, Carmen and Moritz were united by their appreciation for the aesthetics of furniture and home accessories, the main focus of Lemongras Design. The almost symbiotic union of European and Asian traditions, as well as the merging of furniture and product design, greatly benefit their creative process and is clearly visible in the unique work which they create. Lemogras Design Studio has received various awards for their work. “Polo”, the folding bistro table, received the very sought-after 1st prize at the International Milan Furniture Fair in 2006.